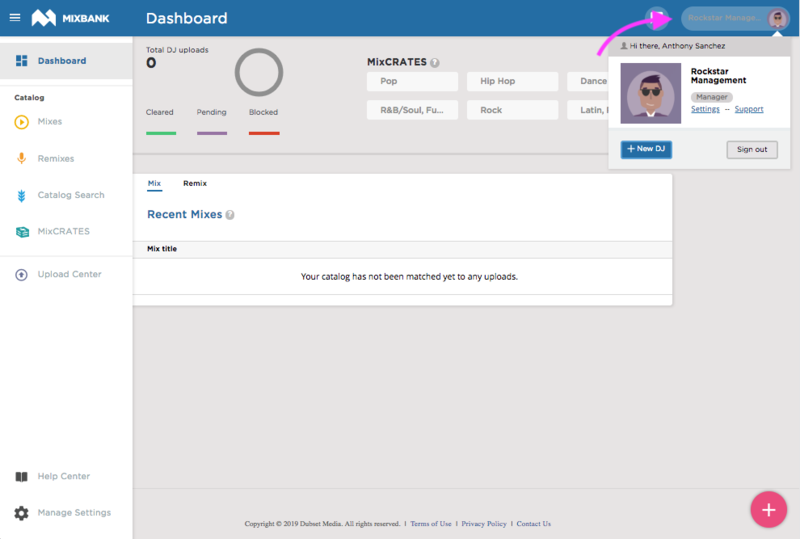 If you've signed up for a DJ Manager account you can add the DJ(s) that you manage directly to your account, which will give you access to their stats, and the ability to upload content on their behalf. *Please note* At this time you are only able to add a DJ to your account that does not currently have a MixBANK account. If you need to add a DJ that already has a MixBANK you will need to contact our support team who can help you out with that. You can do so by clicking on the teal speech bubble icon. Step 2) Click "New DJ"
Step 4) If you'd like to create multiple accounts at one, you can do so by clicking "Add another row"
Step 3) Click "New User"
Step 5) Click "Invite to one or more organization"
Step 6) At this point you'll be able to click on a dropdown and select which account you'd like to add this DJ's email to. Note that you can add them to multiple DJ accounts at once. Once you click submit, the DJ will receive an email that which will prompt them to make a password, and grant them access to the account.